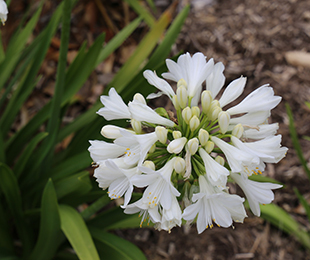 Description: Bingo White™ Agapanthus produces bright white flowers for a longer period. 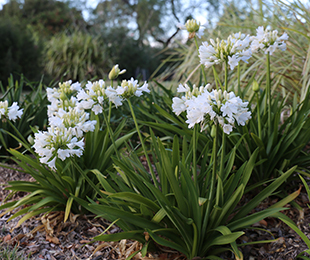 Flowers can be seen en masse from October to November, and sporadically throughout the year. This compact form has good disease resistance and is tough, drought and frost tolerant. Size: 40cm high x 60cm wide; 60-80cm high flowers. Uses: Garden beds, borders, patio pots, planter boxes. Position: Full sun to part shade. Drought and frost tolerant. Suited to most soil types, but thrives in rich soil. Care: Water as required for 8-13 weeks until established. Plant in a well mulched garden (chunky mulch is recommended). If required use slow release fertiliser in spring (for best flower production). Remove older leaves and spent flowers stems as required. Where it works: South QLD, NSW, ACT, VIC, TAS, SA & WA. Top Bingo White™ Wholesale Growers – Coming Soon! Eligibility of this plant as a registerable plant variety under section 43(6) of the Plant Breeder’s Rights Act 1994 will expire on 20/3/2019.